A new crowdfunding platform, SaveOurCommunityTheaters.org, has launched to help rural movie theaters make the migration from analog to digital media. In a move that is expected to save billions in distribution costs for movie studios, by the end of 2013 Hollywood plans to to stop distributing movies on 35-millimeter film and convert entirely to digital movie distribution. This conversion will save billions for studios, which will no longer need to deliver cumbersome film. Most movie theaters in large cities have already converted to digital media, but more than 3,000 throughout rural America have not made the change due the cost of installing new digital movie equipment. Michael Hurley , owner of the Colonial Theater in Belfast, Maine estimates that 20% of all theaters in North America could be lost. Community theaters are fundamentally important to the health and wellbeing of communities. Often these theaters have been around for generations and are part of the fabric of the town. They provide history, a meeting place, and employment, said Wilson. SaveOurCommunityTheaters.org has fundraising project ideas, web assistance, promotional suggestions and utilizes next generation fundraising technology – Circlefunding – to assist small town theaters. Unlike many other Crowdfunding sites, which promote a variety of projects, SaveOurCommunityTheaters.org focuses entirely on community theaters. Launched as a piece of zero-budget, webcam-shot fun in 2008, the series is set in the months after a worldwide zombie apocalypse, applying a healthy dose of wry British humour to the adventures of three incompetent survivors more interested in video blogging than survival techniques. 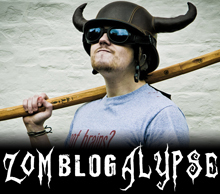 Blogging and Brains and Beans: How 3 idiots survived a Zombie Apocalypse. Over four years it picked up hundreds of thousands of views online and a dedicated fan base including genre legends like effects guru Tom Savini, Walking Dead comics artists Charlie Adlard, SFX Magazine and zombie film directors Marc Price (Colin) and Dominic Brunt (Before Dawn). Original creators Hannah Bungard, Tony Hipwell and Miles Watts, fresh from micro budget features Crimefighters and Whoops! that were highlighted by reviewers at Empire, Time Out and Sight & Sound, have now teamed up with producer Steve Piper at British indie mainstay Coffee Films to reboot the series in a feature length format. “It’s been a great few years and we feel very lucky to have been able to keep progressing making films which edge the budgets and production values up every time, but it’s difficult making the jump from micro-budget tens of thousands to the hundreds of thousands an adaptation needed,” comments Watts. The four filmmakers began developing a feature length screenplay almost a year ago, investing in development time to avoid the back-to-back-episodes feel many series adaptations fall into. Promising to keep everything fans of the much loved web series delivered, scaled up to a true long-form storyline, the concept has already picked up interest from distributors and turned to crowd-funding to bridge the gap from screenplay to production. The Zomblogalypse crowd funding campaign runs through April looking to raise £10,000 to meet pre-production costs, and has already pulled 15% of that within a few days of launch. Check it out yourself to reserve a DVD or fulfill a dream to be a screen zombie at http://igg.me/at/zomblogalypse/x/1907888. HOLLYWOOD, CA–(Marketwire – Nov 30, 2012) – EarlyShares (www.EarlyShares.com), America’s premier Equity Based Crowdfunding platform, announced today the formation of a strategic partnership with Five by Five Media, Inc. (www.5x5mediainc.com), the West Hollywood production company with five TV series set to air in 2013 and a slate of 12 feature films. EarlyShares will allow people to invest in entertainment projects, with their favorite actors, and/or subjects at an early stage. EarlyShares and Five by Five Media will be partnering to fulfill the promise of Equity Based Crowdfunding for the creation of premium, entertainment content to be delivered across all platforms, on all devices, everywhere and at any time. In addition to writing the press release, which is what we call the shotgun approach because press releases that are written with the right SEO strategies in mind push information to hundreds of media outlets and blogs everywhere. Pushing PR messages out via a professional news wire service is the first step, but we go one step further for our clients. We also are experts at using strategic media relations to pitch news stories to key reporters, which most marketing folks would say is a pull marketing strategy. To summarize, we push our client’s stories to the masses using press releases which reach many readers directly via Google, and then pull the PR messages through the channel (media outlets) by working closely with the most appropriate media outlets to secure positive media coverage. Melodika.net- Cutting Edge Crowdfunding Site, EarlyShares cuts deal with Hollywood Studio..
Crowdsourcing.org, Investment Crowdfunding Platforms. Who’s Funded? When written correctly a press release can literally wind up on hundreds of blogs, newspapers, magazines, and TV media news outlet websites. Clip here to see the full Marketwire clip report. This story was picked up by 210 media outlets with a total audience of 83.7 million viewers.